Let's say you'd like to take a big vacation to somewhere exotic, like maybe Korea. But a trip to Korea is pretty expensive and you don't really have the money in this economy. 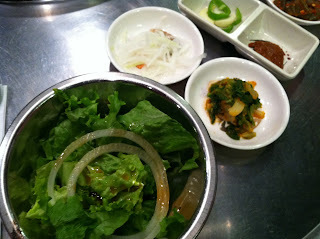 Well, here's a much less expensive alternative to feeling like you're in Korea and you get a unique meal thats super yummy. Go to the HoneyPig in Centerville, VA (or in Annandale or Ellicott City, MD). you should note they are open 24 hours too! When you step foot in the door of this place, you must be ready for an adventure. Almost nothing is in English. 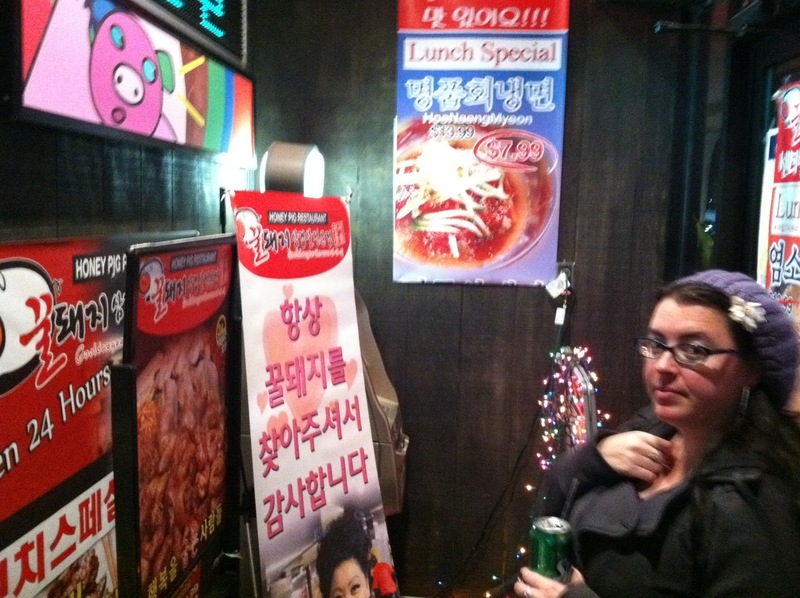 In fact, the walls are plastered with posters, all written in Korean. All the TV's mounted on the walls are playing Korean news and TV shows. The music playing overhead is some kind of Korean pop music. 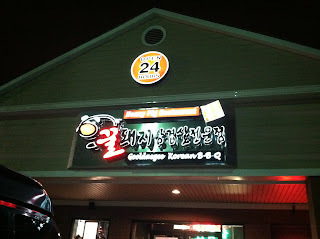 All the waitstaff is Korean. And if you're not Korean yourself, you can be sure you will be in the 3% of customers there who aren't Korean as well. There is just enough English on the menu so you can order your main course food item. 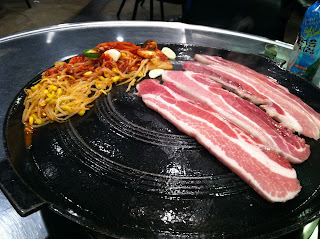 They have things like pork belly, pork ribs, beef brisket, octopus, chicken, kimchi, tofu...as well as pork necks, beef intestines, tripe, and seafood pancakes. 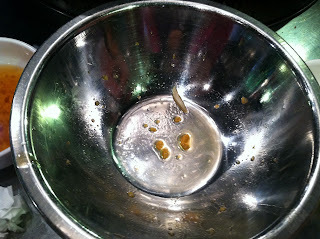 Even some crazy drink called Soju, which I think we figured out was fermented sweet potato. The walls are made of corrugated metal and the tables are made of stainless steel with a large burner in the middle. 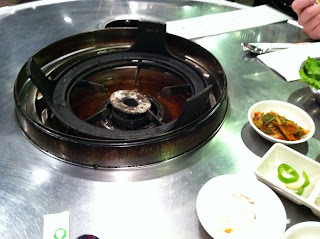 They light the burner and bring out a large metal lid which is placed over the fire. As the metal lid heats up, thats what they cook your food on. As we were waiting for this process, they brought out numerous small bowls and dishes, which at first we had no idea what they were or how to eat them. It turned out to be a really tasty green salad with this sweet dressing plus sides of kimchi and other veggies in this spicy red sauce. They even gave us a complimentary steamed egg soup. I'm not really sure what exactly was in it but it was really eggy and warm and yummy...almost the texture of fine grits. Oh and the only utensils you are given are chopsticks and a spoon for soup. So get your chopstick fingers ready! 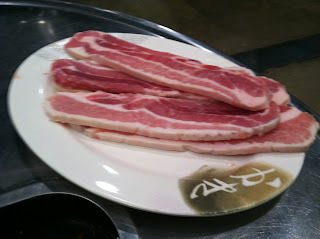 We ordered thick sliced pork belly and beef intestines. The pork belly is pretty much like really thick fatty bacon. 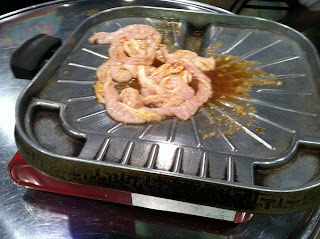 The intestines looked exactly as you might expect. 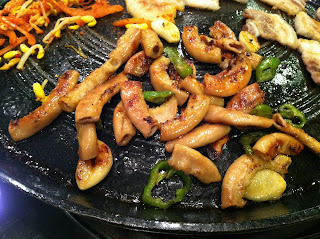 As they bring them out raw, they look like slimy long tubes, which they chop up into smaller pieces and cook them in a separate pan with some kind of sweet teriyaki-type sauce. 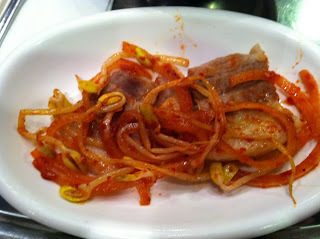 When they are mostly cooked, they are transferred to our hot metal cooking lid to finish cooking along with the pork belly and a load of kimchi with noddles and soybeans in a red sauce.And we were also served a small bowl of sticky white rice. Everything....and I mean everything...was super yummy! I have to be honest, I was a little nervous when Superking ordered the intestines. I wasn't sure if I was going to go for that. But I have to tell you, it tasted delicious! I think whatever sauce they cooked it in helped give it a sweet quality. But it wasn't super chewy like I thought it might be. It was slightly tougher than a noodle. I really liked it! 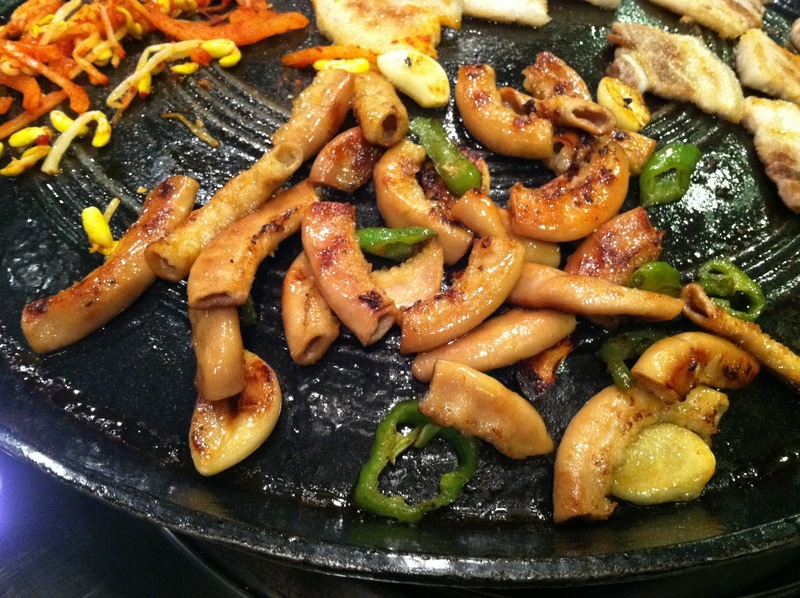 It was interesting to see the looks on the faces of some of the Korean customers and our waitress when the intestines were brought out. Our waitress looked at us doubtfully, "did you order this?" as she begins cooking it up. I'm sure not many people, especially non-Koreans, order that too often. 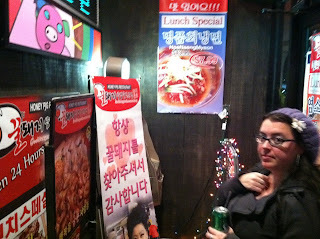 We really felt as though we were temporarily transported to Korea while we were there. 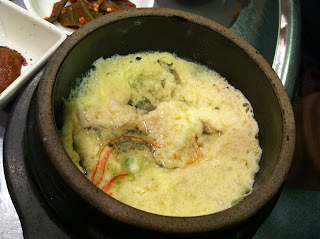 This was definitely a true food adventure and we came out on the other side finding a new kind of food to love! If you're feeling adventurous or if you already enjoy Korean food, you must go to HoneyPig! my coworker highly recommends it! Joelle, we love Ethiopian! Let us know when you wanna go and we'll tag along!